Fallout 4 what is new? I assume that you are aware of Fallout 4 release at 11.10.2015. About Fallout 4 what is new is the typical question that some people ask. Especially the ones who couldn’t have the chance to play yet have all the right to wonder about the games new features. So, here are the news about Fallout 4! Fallout 3 – 2277 – Washington, D.C. The latest and maybe the most innovative new feature in Fallout 4 is building your own settlements. Since your settlements can be attacked by raiders, supermutants, and other bad stuff, it’s good to have strong defenses. You can even see a settlement which has an incredible bar. The ways you can build your settlement is limitless. Only limit is your imagination. You can even grow plants in irradiated zones. You can build bedrooms, towers, docks, energy generating staions and many more things. You can provide water and ellectricity to your settlements by building generators and pumps. By doing all of these you can build a steady income. Also non-player characters and merchants can inhabit your settlement and help you to keep your settlement running as a community. You can also send brahmin caravans between your settlements. You must also remember that raiders will try to attack your settlements. So you can’t build your settlements just anywhere. You better remember to add self-defense systems too, like turrets, traps and towers. Vault-Tec Assisted Targeting System (V.A.T.S.) may be familiar to some of you if you have played previous Fallout games. V.A.T.S. is one of the unexpandable features of Fallout and we of course are happy to see it again in Fallout 4. The new V.A.T.S. is almost the same with the ones that we’ve met in previous games, but this time it is more realistic because now you can’t just fully stop the time forever, but you can concentrate in a slow motion. Yes, that’s right. Now you will get into slow motion during V.A.T.S. and i actually think that it is better this way. Gives the realistic feeling instead of just stopping the time. You can choose between various strategies using VATS. You can headshot for quick kills, or shoot your opponents legs for slowing them down or you can disarm them by shooting their weapons. One of the new things that you will come across in Fallout 4 is the new dynamic dialogue system. At Fallout 3 during dialogues you were talking only face to face with NPCs. In Fallout 4 the new dynamic dialogue system presents us the dialogues between players in a theatrical way. You won’t be getting bored from dialogues that easily. The new crafting system allows you to use every lootable object in the game to your own benefit during crafting. You can build items and structures for your settlement, customize weapons and upgrade your armor. You can scrap items to use in your workshop for crafting new items. In game you will have your workshops to craft and upgrade items. And you also have a stocking space for our power armor. 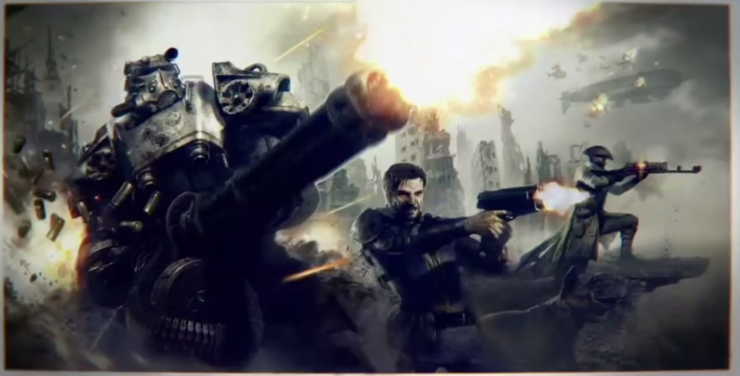 I don’t have to mention that there are different types of power armors in Fallout 4. So these are the main new features in Fallout 4, but not only. You definetely will find many more interesting things during your gameplay. It’s a huge open world of Boston that you can explore which has many freaky scenarios in it. When playing Fallout 3 i’ve never got bored, and i’m sure that it will be the same for Fallout 4. Your comments are highly appreciated. Please don’t hesitate giving feedback or contact through santa@santagotgeek.com. See you later! I knew that Fallout 4’s character customization was good, but I didn’t know it was *that* good! Those celebrity/public figure Fallout 4 character creations were just amazing! Another new feature in Fallout 4 that I thought was cool was how, depending on the name you choose, Codsworth will actually say it. I wasn’t expecting it when I first played through, and was very surprised when I heard it! Yeah the new features in Fallout and what people can do with it are really amazing! The only thing that i wasn’t fully satisfied about is the interface (health bar). Sounds like an interesting plot. Cryosleep is always a topic that interests me. In Tempe, AZ there is a place called Alcor where people are frozen right before they die. Iâ€™m not sure if theyâ€™ll ever be able to revive these people, however, the idea is certainly interesting. That first video is quite violent and graphically explicit. Iâ€™m not much of a modern gamer. Perhaps this is the norm with modern games. The new features you point out will certainly add to the game. The more customization in a game, the better I like it. Dynamic dialog is also something of interest. I like a game with a good story that involves the player as much as possible. Sounds like it may be the place where the developers took the idea from. Do frozen people still lie there in their frozoen state? Yes, as you said, violence is quite the new hype with the new games. It has become a norm. But there are many psychological issues also added to games which makes me really want to play it all day. Judging ethics and philosophing around, giving social messages. That’s what must be in a game with a good storyboard.